Stefan Bachmann is a writer and musician. He was born in Colorado and now lives with his family in Zurich, Switzerland, where he attends the Zurich Conservatory. He began writing The Peculiar in 2010, when he was sixteen years old. I have four siblings, and play five instruments. I live in a hundred-year-old house in Switzerland. I was homeschooled, which I assume explains everything. I was also stung by a jellyfish once, which might explain a few things, too. I won’t be twenty for a while yet. I would really like to be a film composer and write wildly exciting music. I like movies, books, travelling, and chocolate. If I met you, I would probably like you, too. 1. Why is your blog called Scathing Jellyfish? It’s a PUN. I think. And I love puns. 😉 But no, seriously, I was stung by a stingray in Greece, and then I forgot it was a stingray and told everyone it was a jellyfish, and I like scathing humor (in fiction, not real life) so that’s what I figured the blog should be called. Makes total sense, surely. 2. How did the fact that you were not yet eighteen affect the publishing process for The Peculiar? I think it might have helped pique editors’ interest during the submission process. Like, between reading the pitch and starting the manuscript. But if the first pages had been lousy it probably wouldn’t have made any difference if I were eighteen or three. Before I was published I kept hearing, “Oh, teenagers can’t write. *lists off mediocre books by teenagers*” And after the book sold I kept hearing, “Oh, of course your book was bought, you’re so young!” Uh, great. The thing is, writing only has a tiny bit to do with age and a lot to do with practice. I’m still practicing, but I did write four books and a crazy number of short stories before my stuff came anywhere near the point where people would pay for it. 3. 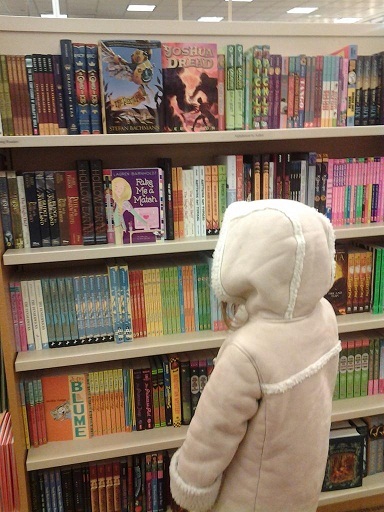 How has your family reacted to your book’s success? My family’s been great about it! My older brother drove me most of the way across America for book tour, even though my publisher offered to fly me. And my sister and Mom still read everything I write and encourage and suggest and mark things up with red. 4. For most debut authors, “book tour” means guest posting on their friend’s blogs and maybe a signing in their home town bookstore. What kind of tour did you do to promote your book? I got to go on a one-month-long-driving-and-flying-all-over-the-place book tour, and it was the BEST. And a lot of work. But fun work. We started in Colorado, road-tripped to Minnesota, Michigan, then split up in NYC, and I flew down to Texas and then up to Chicago on my own. 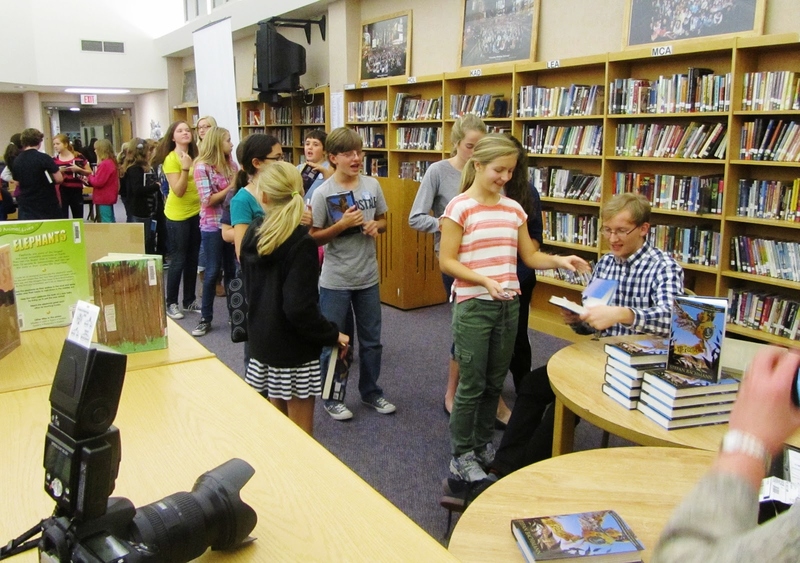 Did a ton of a school visits, bookstore signings, met my editor and a bunch of other awesome people at HarperCollins. I’m so grateful I got to go. 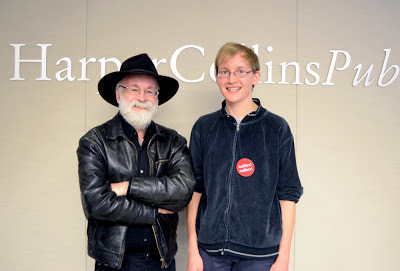 Stefan noted that while visiting HarperCollins, he wore a big “author” button. Terry Pratchett, of course, did not need such identification. I don’t think it was a big deal. As far as I can tell, publishing happens mostly via email and phone anyway, regardless of whether you live in the next building over from your publisher or in another continent. In fact, I hear people in publishing email each other from one office over. So yeah, as far as I know, it wasn’t a problem. 6. How much input did you have in the creation of your cover? I didn’t! And that’s ok. The jacket art was done by a guy named Thierry LaFontaine who does concept art for movies like Tim Burton’s Alice in Wonderland, and the book design is by Paul Zakris, and I think they made it look fantastic. I still sometimes just pick up the book and stare at it dorkily. The hardcover is just really, really detailed and good-looking. It has rough-cut pages and embossing and spot-gloss and tons of shininess. There is shiny all over that book. 7. Why did you move from Colorado to Switzerland? My parents’ work. My Dad’s a Swiss business person and my Mom’s an American artist, so at some point they must have agreed on the fact that Switzerland was the place to be and work. 8. How many languages do you use regularly? Swiss German and English. I speak German at my school with my teachers, English with most of my friends, and kind of a weird mix of English and German with my family. I speak a tiny bit of French, too, (badly) and high German, of course. 9. What kind of history does your house have? It was built in 1889, but I’m not sure it has much historical significance. It’s just a big old farmhouse in a little valley between a bunch of hills and forests. It was a really great place to grow up in, though. I love it, and I love the surrounding area. 10. With seven people in the family how do you keep real candles lit on the Christmas tree without burning the entire house down? 11. When you looked for an agent, did you purposely choose one who is based in Colorado? I didn’t! I actually had an offer from another agent in NYC right around the time Sara offered, and I kept wondering whether it would make any difference that Sara’s in Colorado and not in New York. Answer: it doesn’t. She’s a great agent, and she handles everything the way any NY agent would. It was really a coincidence that I ended up having a Colorado agent, but it’s cool now that I do. Nelson Agency’s office is like 45 minutes from where most of my relatives live. 12. I can’t believe we both lived in Longmont! Albeit years apart, as I am more than twice your age. Do you remember the roller skating rink, or the Carousel in Twin Peaks Mall? The Mall was brand new in my day. I KNOW. Small word. I only remember really random things from Longmont, alas, but we do have a family story about how a cousin would smuggle my two older brothers under the bars of the skating rink. The delinquents. 13. Where and what are you studying now? I’m a student at the Zürich Conservatory, studying piano, recorder and composing. 14. What are your long term goals as a writer and…as more than a writer? 15. How much of a score have you composed to go with The Peculiar? Just a few pieces. I think maybe three or four for some of the key scenes in the book (Mr Jelliby chasing the clockwork bird through London, etc.) and then the book trailer music. It was fun to do! 16. When will the next book, The Whatnot be released? The plan is for Fall 2013. I hope I can whip into shape in time. I’m really excited about it, but grrrr, second books are hard. 17. What is your favorite electronic or digital writing tool? My dinky old desktop. It makes the most insane noises starting up, and I already know one of these day it’s just going to die and I’ll be all like, “WHY DIDN’T YOU WARN ME.” I don’t even bother saving my manuscripts on the hard-drive anymore. Anything important gets saved to a memory stick STAT. 18. What is your favorite non-electronic writing tool? Haha! The woods, definitely. I’ll go on a long walk in them and when I get home suddenly a lot of things will make sense that didn’t before. AmyBeth’s 13yo reading to her 5yo. 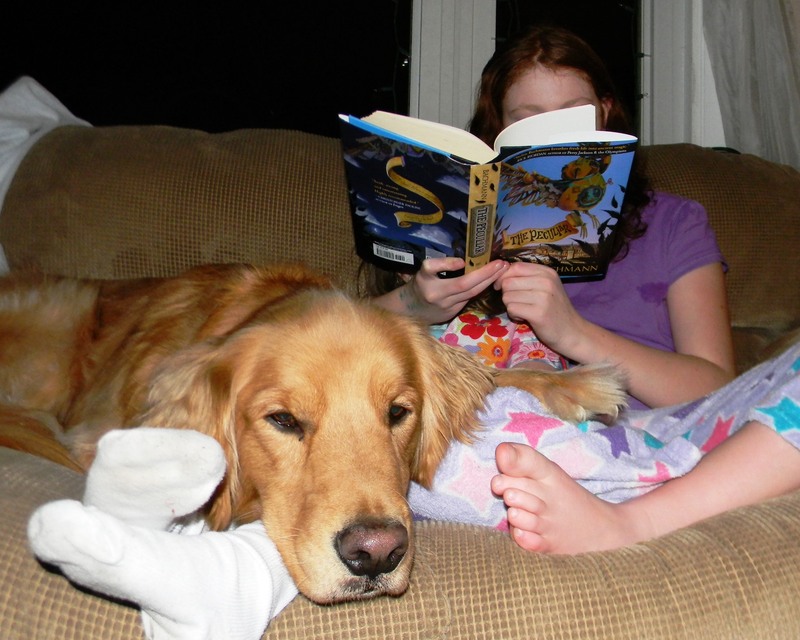 The dog likes storytime too! So many: Twitter, movies, friends, Youtube, book promotion, chocolate, little brothers, pianos, school. . .
Ok, confession: I only remember who Han is. Sorryyyyy. Greedo sounds like a bad guy name, though, so I’m going to go with that. I should probably go re-watch Star Wars now. Also, thanks for having me on the blog! This entry was posted in Interviews and tagged Agent of Awesome, Barnes & Noble, Barnes and Noble, Carousel, Colorado, Colorado agent, composer, Conservatory, delinquents, dorkily, English, family, French, German, golden retriever, Harper Collins, HarperCollins, little brothers, Longmont, musician, Nelson Literary, Nelson Literary Agency, Paul Zakris, read to sister, real candles on tree, Sara Megibow, Scathing Jellyfish, second books, shiny, siblings, skating rink, stingray, Swiss, Switzerland, teen writer, teenager, Terry Pratchett, The Whatnot, the woods, Thierry LaFontaine, Twin Peaks Mall, writer, Zurich. Bookmark the permalink.